GREENSBURG, Pennsylvania - Friends of the only American to be killed so far during the U.S. military relief mission to Somalia say the Fayetteville, North Carolina, man may have had covert responsibilities along with his civilian duties. Friends of former Green Beret Lawrence N. Freedman said Freedman had kept in touch with the Special Forces in the years since he left active duty to become a civilian employee of the Army, the Greensburg Tribune-Review reported Tuesday. Freedman, 51, was buried Tuesday at Arlington National Cemetery in Virginia following a funeral service at the Army chapel at nearby Fort Meyer. He was killed last Wednesday near Bardera when the vehicle he was riding struck an anti-tank mine. Three State Department officials were injured. "He was a soldier's soldier," said longtime friend Arthur Lacey. "He had a lot of influence over a lot of men -- all positive." Some of those interviewed by the newspaper spoke only on the condition that they not be identified by name. "He was always someplace where nobody knew where he was," a childhood friend told the newspaper. "He was always in the forefront of what was happening." 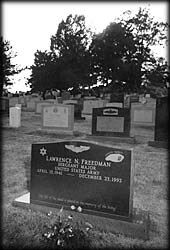 Freedman grew up in Philadelphia and at the time of his death lived near Fort Bragg, North Carolina, headquarters of Army special forces. He enlisted in the Army on September 30, 1965, and served for 25 years, said Joyce Wiesner, a spokesman at the Army Reserve Personnel Center in St. Louis. A medical specialist, Freedman retired December 31, 1990, with the rank of sergeant major. Freedman served in Vietnam for two years and earned two Bronze Stars and a Purple Heart, Wiesner said. After participating in six campaigns in Vietnam, Freedman was stationed for several years in Okinawa, Wiesner said. Acquaintances said Freedman was involved in intelligence work in connection with the U.S. dispute with Libya and also during the Falklands war, in which the United States backed Great Britain's effort against Argentina. They said Freedman was secretive about his military duties. They said they thought he was a member of the Delta Force, a rapid-deployment unit, and that he probably had covert responsibilities in Somalia. State Department officials referred questions about Freedman to the Defense Department, which said such information could not be released without the permission of Freedman's family, the Tribune-Review said. Sergeant Major Freedman was not a Department of Defense employee when he was killed in Somalia in 1992, but was in fact a CIA operative. The Department of Defense job was just his cover while inside Somalia. His nickname was "Superjew" and he relished the moniker. A complete story of him is in Chapter 14 of The Book Of Honor by Ted Gup. On a tip from a CIA employee, Prof. Gup knew only that the fallen CIA operator was the first American casualty in Somalia. He followed a trail of clues through newspaper clippings, obituaries, records at Arlington National Cemetery, Mr. Freedman’s family’s rabbi, and a list of survivors, who talked about the life of the man. “I still had not confirmed that it was Larry Freedman until I contacted his widow and learned about his involvement in the agency,” says Prof. Gup.